1.Choose your mode of transportation and fill out the details of your past or future journey. Did you use multiple modes of transport, please add them as well. 2. Click on pay and add your details. Modes of payment can be Credit Card or IDEAL. Congratulations! 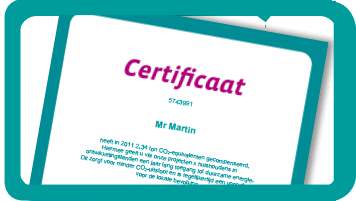 You have offset your CO2 emissions and will receive a certificate in your mailbox.